Reaching out to well deserving students in need and making a difference in their lives through personalized educational sponsorship programs. Providing a reliable platform for well wishers to stay connected with their origin and inspire future generations through personalized sponsorship programs. Sponsors make monetary contribution to address the educational expenses of deserving students they identify from their neighborhood, local contacts (through parent or teacher), schools or local communities in India or make a selection from the list of students identified by WeReachOut. They can also help WeReachOut to find mentors from their region, promote its mission by sharing their experience and its impact on individual’s life to reach out to more deserving students in different parts of India. 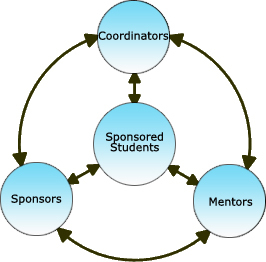 Mentors are the primary contact persons for WeReachOut students, responsible for local coordination and mentoring students to do better in their academics. They also encourage students to get involved in other service-oriented activities based on their ability to realize their full potential and understand what they can do to make a difference in other’s lives. Coordinators are the primary contacts for sponsors to keep them up-to-date on WeReachOut activities in addition to obtaining E-mail updates and via member’s account on the WRO website. They coordinate the overall sponsorship process and manage different functional areas under WeReachOut operations. The convene in a different forum to share their views and provide status of their activities towards WeReachOut’s mission.